Next up in The 2018 PopCult Gift Guide we have the latest album by a 76-year-old man. It’s not just any 76 year-old guy, though…it’s former Beatle, Paul McCartney. 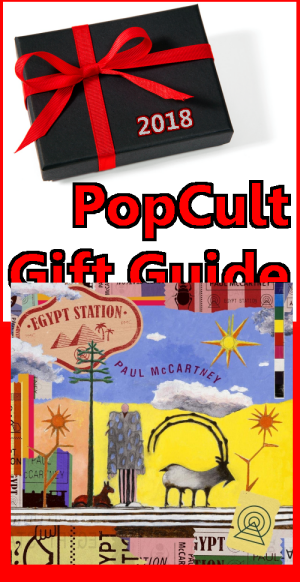 “Egypt Station” is his first new collection of songs in over five years, and it’s pretty impressive: The perfect gift for any Beatles fan who wants to keep up with their heroes. True to the inspiration behind its title, Egypt Station’s 14 songs combine to convey a unique travelogue vibe. Between the opening and closing instrumentals “Station I” and “Station II,” each song finds Paul capturing a place or moment before transporting the listener seamlessly to the next destination. Stops along the way include an acoustic meditation on present day contentedness (“Happy With You”), a timeless anthem that would fit on virtually any album of any McCartney era (“People Want Peace”), and an epic multi-movement closer clocking in at seven minutes with a song suite structure harkening back to the days of Paul’s previous combos (“Despite Repeated Warnings”). The result is a kaleidoscopic journey through myriad musical locales and eras, yet firmly rooted in the here and now–with Paul’s singular unmistakable melodic and lyrical sensibility serving as a guide. “Egypt Station” is a great collection of songs and proves that Sir Paul still has his songwriting chops intact. You can find this album anywhere records are sold, or follow the path of least resistance and check Amazon.